Harris-Stowe's Fall 2018 Commencement program took place on December 15, 2018 with over 70 graduates present. 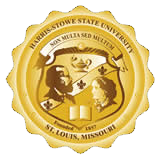 Due to an increase in enrollment, Harris-Stowe was able to hold the first Fall Commencement in the school's recent history. Assistant Provost, Dr. Alonzo DeCarlo, served as Grand Marshal. President and CEO of Greater United Way of St. Louis, Orvin Kimbrough, delivered the keynote speech. Harris-Stowe State University salutes all of our Fall 2018 graduates and wish them great success in their future endeavors. It is great day to be Hornet!